Visiting? 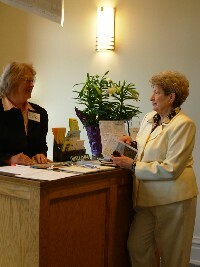 Be sure to stop by the Welcome Center just outside the Sanctuary and sign our guest book. The Welcome Center hosts also have name tags for you, copies of our most recent church newsletter (The Asburian), busy bags to keep youngsters occupied during the service, and other helpful information.